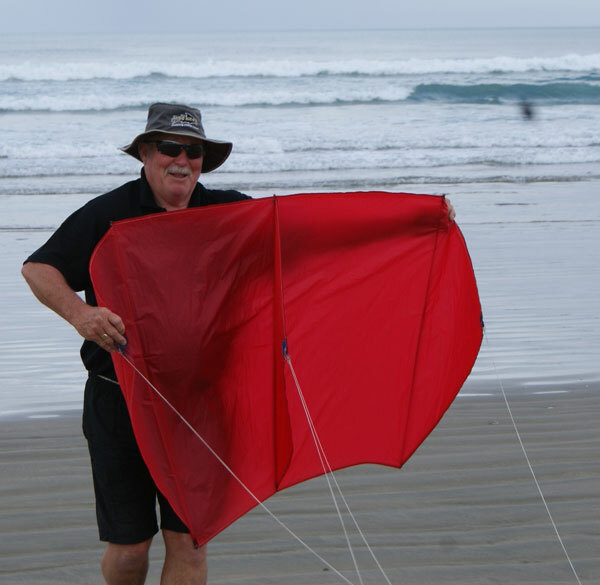 Kora wanted me to send these pics of him and his dad to you to show you what an awesome catch he got off our local beach in Western Australia with the Nighthawk Fishing Kite we got from your company. The Whatuwhiwhi Kitefishing Klassic was fished November 18th to 20th and was another huge success, especially for Paul’s Fishing Kites Ltd team, the PFK Cowboys. Our team was Rob from the shop and his partner Martha. Rob fished with a 65kg Kite Dropper Rig and also took a Mega Mouth Lightwind Kite to ensure he could still fish even if the winds became very light. Rob replaced all of his traces with new 5/0 Double Floating Bead traces. His extensive experiments when fishing the floating bead traces against traces with flashers and normal traces has left him utterly convinced that using floating bead traces for targeting big fish is a winning strategy. He was right on the button with this choice of gear! On the first day the wind was North Easterly, around 15 knots, so the teams were all sent to 90 Mile Beach for the day. Lines were allowed in the water at 6:00am with a maximum number of 10 hooks per line. It rained consistently all day which made it uncomfortable, but the fish were on the bite up towards the bluff where Rob was fishing. The bottom end of the beach, especially around Waipapakauri, didn’t seem to fire at all. 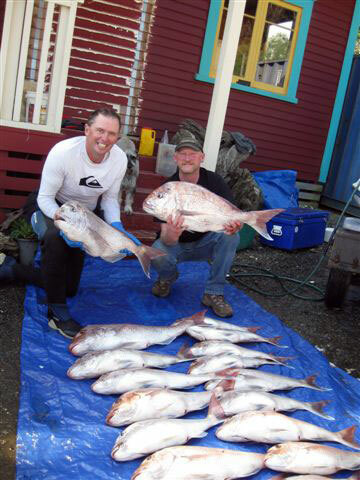 Robs catch on the first day was 16 snapper, eight kahawai and three gurnard. He had only caught one gurnard prior to his last set, so for his final shot he set the full 1800 meters out to better target the last two gurnard further offshore. By the end of Day One our Rob was leading the contest by about 2.0 kgs! Rob headed right back to the same spot as the day before, in his words “you don’t run away from good fish!” Results were miserable though and he only wound up with one snapper and two kahawai off two sets. He then moved around 10 kilometers south towards Waipapakauri. 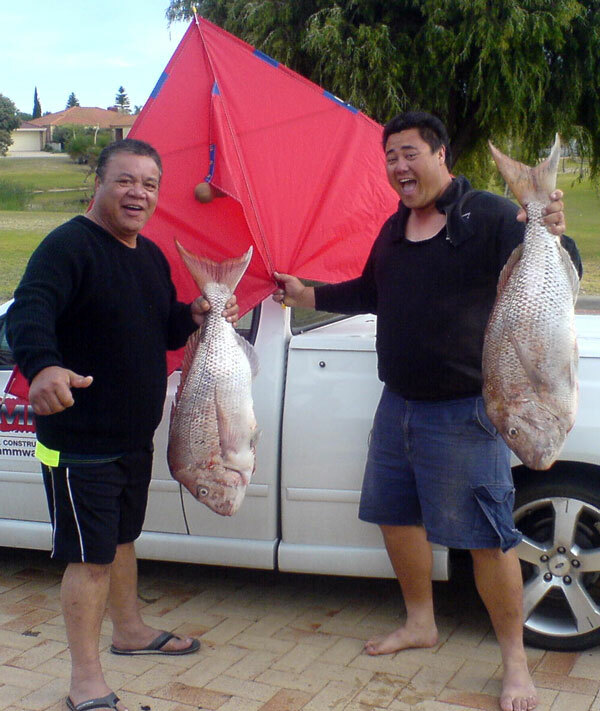 This certainly was the right move and he caught more snapper up to 8.1kg and a few kahawai. Rob had the overall lead so far by around 10 kgs. The winds dropped to almost nothing and the contest was declared open to anywhere entrants could find some wind. Rob managed to get half a set out (five hooks) to around 40 metres offshore before the Mega Mouth Kite (our Ultimate light wind kite) gave up and lazily wound up in the tide. Rob still managed to get one kahawai this set and this one lonely fish was the clincher at the prize giving. 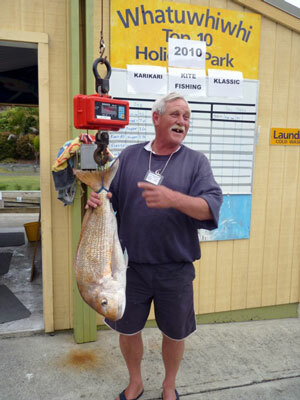 There was only three other fish weighed in for the whole of the day due to the almost non-existent winds. 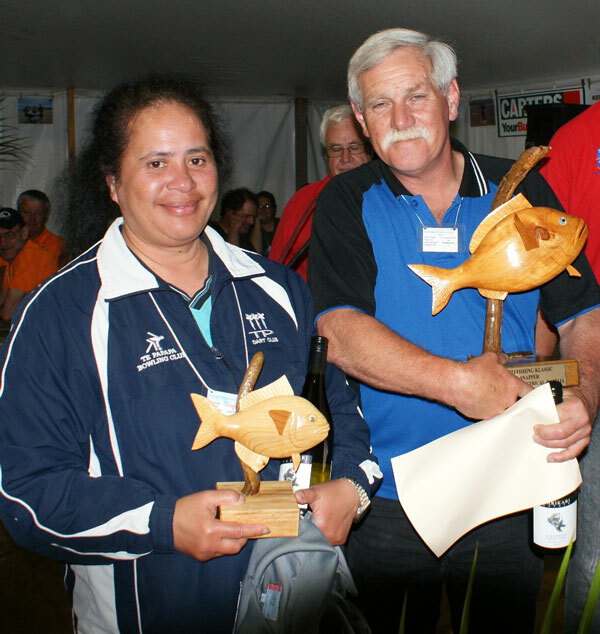 Above: Rob and Martha with the two most sought after trophies of the Whatuwhiwhi Kitefishing Klassic Tournament. We have the miniature trophies and certificates proudly on display in store. Well Done Rob and Martha!!! If you haven't tried floating bead traces yet you could be missing out on some big fish. We have had so many fantastic reports on the 5/0 Double Floating Bead traces the evidence for their efficiency is overwhelming. If you make your own traces the beads are available separately or you can buy the complete floating bead traces which are expertly pre-tied to the correct length to fit our trace racks. Both products are available in our online store. Be sure to check out the new longline instructional video below to see the traces in action and learn how to bait them correctly. Morgan and I spent a couple of days filming at Whangarei. 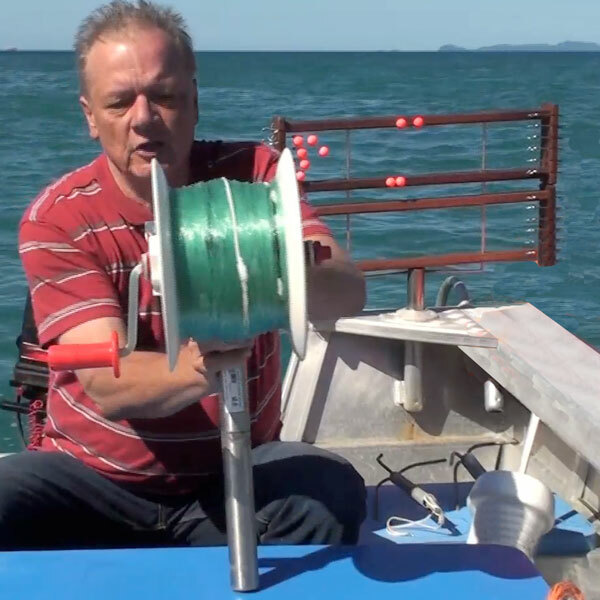 The first video is a very informative demonstration of how to run boat longlines single handed. It covers everything from the floats and droppers to baiting, setting and hauling. The fishing was hard but we managed to get a few fish. Both videos are at high resolution on our YouTube Channel and are best viewed full screen if you have broadband. 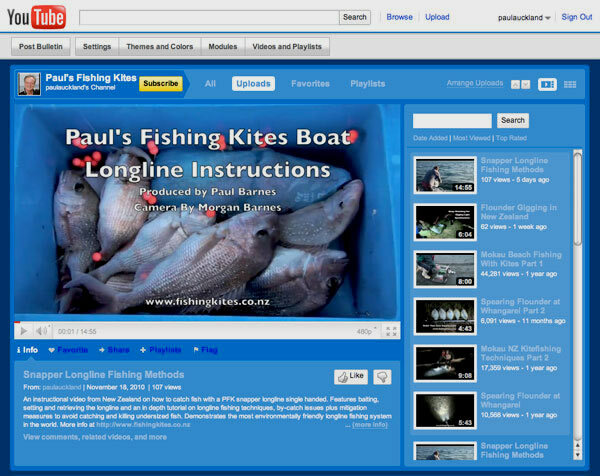 We also have 13 other fishing videos featured there. You can vote, leave comments and ask questions on our channel page or on each video, please take the time to do so - we would love to hear what you think. If you want to know when we post a new video be sure to subscribe on our channel page. Boat Longlines are a great tool if you want to ensure a decent catch for the day. They also allow you to catch good bottom fish while you are trolling, diving or cruising. The PFK longlines are simple to set and retrieve, unbeatable quality, and include a whole load of extras you can't get anywhere else! They are also the most environmentally friendly longline in the world due to the Target Snapper Hooks we fit to all of our terminal tackle on kite and longline rigs. Includes: Reel and reel post, 26 double floating bead traces on a kwila hardwood trace rack, stainless steel trace rack holder, grapples, drop lines and hook section all ready to set from reel. 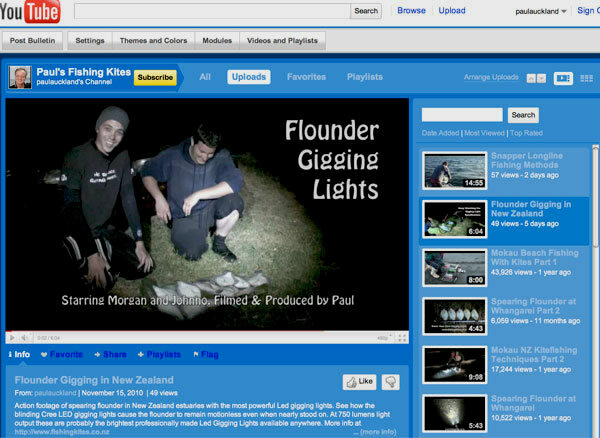 The second video is flounder spearing with PFK's new more powerful LED underwater lights which have longer burn time . It was Morgan's first go at floundering and there is some great footage in clear water. The water is already fairly warm an we found good numbers of flatfish are in shallow. The three and a half hour burn time of the new lights worked out perfectly for us, we had a three and a half hour session and got back to the car with ample light in reserve. If you are like us then you will find spearing flounder is an easy way of getting a taste of something other than snapper and gurnard. And they are great eating! The frame from the video below shows how crystal clear water was. This flounder is in water around 500mm deep. 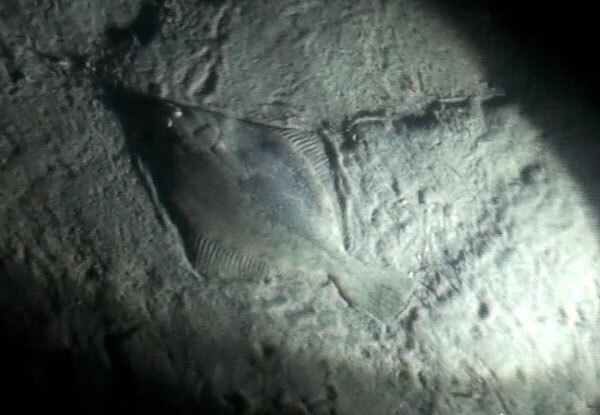 We were spotting flounder up to 10 meters either side of us with the new Underwater LED Flounder Lights. Ed: Congratulations to Geoff on getting on the cover of the latest Fishing News Magazine. Over the years Geoff has caught numerous huge snapper and has taken heaps of photos for this website. Getting a big enough fish is hard enough, getting a top quality photo of it is equally difficult. Getting it accepted by Fishing News is a real trifecta! I took a whitebaiting mate out fishing from the beach at Mokau in mid October in my little Mac boat. And look what happened. Snapper Slayer strikes again! Above: Most people struggle with neatly filleting fish of this size but Geoff has had so much practice, big fish fillets in his kitchen looks better than the displays in many fishmongers windows!